What is the difference between urethane and polyurethane car paints? We’ve had so many questions about urethane vs polyurethane we decided it was time to share a little on the subject from the polymer chemistry and the historical marketing side of the automotive aftermarket industry. The term urethane and polyurethane has been thrown around a lot in the industry and used by sales & marketing professionals to present their product in the best light. Our goal is to give those interested in learning the fundamentals of the chemistry the knowledge to empower themselves to make the best decision for their application. First of all the chemical “urethane” is not used in paints and from the chemistry perspective the term “urethane” is not an accurate description of the type of resins used in paints. The chemical “urethane”, also known as ethyl carbamate, is a toxic small molecule chemical once used in pharamceuticals but long since abandoned due to its toxic characteristics. What can be found in many paint films is a “urethane linkage” which is a key building block found in some polymers (extremely large molecules) and a key factor in determining performance properties. In general, paints containing “urethane linkages” typically exhibit greater toughness and durability than non-urethane linkage containing paints. Paints that do contain urethane linkages will contain many many urethane linkages which technically makes them a poly-urethane since the definition of polyurethane is “many urethane”. So, from a chemical perspective polyurethane is proper term to describe automotive paints that are often called urethane. The use of the polyurethane and urethane terminology has largely emerged as a need to differentiate products that have varying performance. It is fact that the performance of polyurethanes can vary greatly depending on how the polyurethane is formed and the formulation of the finished product. Polyurethanes are formed by the reaction of “polyols” with “polyisocyanates”. In the automotive aftermarket this reaction commonly occurs during and after the product is being applied as these type coatings are typically two component or “2K”. The clear or color typically contains the polyol ingredient while the “activator” or “hardener” contains the polyisocyanate “co-reactant”. The type of polyol and polyisocyanate largely determines the final performance. The chemistry of the polyisocyanate co-reactant is relatively similar amongst most 2K automotive after market coatings. However, the polyol portion varies widely. Polyol types vary greatly accounting for a wide range of performance properties and applications of polyurethanes ranging from soft and permanently flexible polyurethane membranes, to hard and impact resistant bowling balls. The two main types of polyols used to create polyurethanes most often employed by coatings’ manufacturers in the automotive aftermarket segment; acrylic polyols and polyester polyols. Performance form each can vary widely depending on the composition of the polyol itself. Therefore, it is very difficult to generalize performance based on the type of polyol used. The reason to bring this up is that some would argue that acrylic polyurethane (polyurethane built from acrylic polyol) is a superior product but this is not universally the case as some acrylic polyols have horrible durability performance. Others have also used the term “poly-urethane” to describe polyurethanes built from polyester polyols. 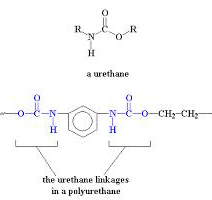 This makes the terminology confusion since, as we discussed earlier, all urethane linkage containing coating systems are really polyurethanes whether built from acrylic or polyester polyols. The performance of polyester polyols also varies widely making it difficult to generalize any performance based on the name. That is why it is best not to focus on the name of a product rather focus on the performance data a recommendations from fellow users. In summary we learned that urethane finishes are actually all polyurethanes from a chemistry perspective and that saying one polyurethane is better than another (acrylic polyurethane for instance) is not an advisable way to choose a product. For best success long term focus on the performance data and unbiased reviews of a product to ensure you are getting what you expect. Furthermore, don’t use price as a quality indicator. For most automotive coating name brands the price of the raw materials and manufacturing overhead is only a very small part of the total cost. Most of the cost comes from large profit margins and exorbitant marketing budgets.